Microsoft has released a tutorial game called Ribbon Hero in its Office Labs. 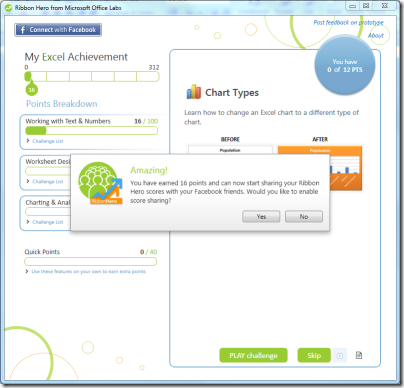 This installs an Office add-in for Word and Excel which watches you work. It has several features. When you perform an action such as Copy and Paste for the first time, it awards you points. You get further points by performing “challenges”, where Ribbon Hero generates a document and sets you a task, like removing duplicates from a table. Finally, you can upload your score to Facebook to share with friends. I gave it a go. It worked, though on the second challenge I got the right result in what the Ribbon Hero clearly considered to be the wrong way, which was annoying. Hint – use the Ribbon. Should have thought of that. Ribbon Hero is easily impressed, and on a quick look the tasks are mostly basic ones, though I guess they could be expanded if the idea proves popular. Irritating and patronising, or a brilliant training tool? Well, learning by doing is a good principle so I don’t dismiss it, even if my own reaction is more the former one. The interesting aspect is what the existence of this tool says about Office. Not everyone gets on with the Ribbon; some miss the old menus. Further, Office is so bloated feature-rich that knowing it in depth is a formidable task. I have often been told that the majority of wish-list requests are for features that already exist. In consequence, a large part of the challenge for Microsoft’s Office team lies in enabling users to operate the product successfully. This is not a new problem; the notorious “it looks like you’re writing a letter” Office Assistant, or Clippy, was another attempt. The Ribbon itself was also meant to address it, though I am convinced that Microsoft also intended to differentiate itself from the competition and to devise a user interface it had some hope of protecting, if necessary, in the courts. You could argue that the very existence of Ribbon Hero is an admission of failure. The perfect office suite would not need a game to teach it; it would work so much in accord with what the user expected that it would not be necessary. I use Office all the time and respect it. That said, eventually Microsoft (or a competitor) will need to remove features rather than adding them, or to retire Office and deliver something better in its place, that achieves the same goals but with less complexity – if such a thing is possible. And if it is going to happen, it will happen on the Web; for some, it already has.